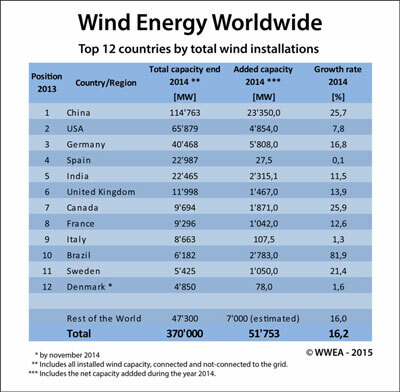 2014 was a record-breaking year for the wind industry as it grew 44% worldwide, says the Global Wind Energy Council. The industry added 51.5 gigawatts (GW) bringing the world cumulative total to 369.6 GW. China, still the leader, set its own record by installing 23.4 GW - almost half the world's new capacity, and more than any country has added in one year. China has 115 GW of wind farms. Europe added 12.8 GW, and Germany installed almost half of that with 5.3 GW of new wind, growing 58% from 2013. Germany now has 38 GW of onshore wind and 2.4 GW of offshore wind. Renewable energy currently supplies 25.8% of the country's electricity. European countries are now connected to nearly 2,500 turbines as part of 74 different offshore wind farms, reports the European Wind Energy Association. Total installed capacity there reached 8,045.3 MW in 2014. Denmark had a watershed year, with wind producing 39% of its electricity, as did Scotland at 32%, and the UK, Spain, Portugal, and Germany get at least 10% from wind. Wind energy now accounts for about 5% of global electricity demand.